Mary Stratigou is an international human rights lawyer and researcher with long experience in refugee and migration issues. She has completed her Master studies in Human Rights, Gender and Conflict studies: social justice perspectives in the Erasmus University of Rotterdam. She is the Deputy Partnerships Director in the World for Refugees organization and fluent in English, French, Spanish, Turkish and Arabic. Human dignity defined in terms of an adequate standard of living is a key figure within refugees’ treatment discourses. Respecting them as a vulnerable group of people forced to leave their homes for a wide variety of reasons and protecting their unalienable rights is always an issue at stake within societies, even in the most liberal and democratic states. The present paper problematizes the idea of providing humane living conditions for refugees as long as their asylum process is under consideration. Using a socio-legal approach in understanding human rights norms and laws, it is argued that these norms do not constitute independent values but are embedded in social, cultural and economic contexts. Through the lenses of the Greek society’s characteristics and specific needs, the study examines the necessity for international human rights norms’ translation and their framing into familiar for local people terms. The role of institutional and transnational actors is deemed to be determinant towards this direction by simply constituting mediators between the international or regional and the national level. Consequently, when a state or society itself is not able to realize the value of human rights norms and regulations and effectively implement them, non-state actors such as NGOs lay the foundations by providing the guidelines for local people and government officials to follow. Thus, delinking human rights ideas from the ambiguity and embedding them into each society’s context will be the main argument in order to approach refugees’ right to human dignity and adequate living standards. Negotiation for a better quality of living conditions and opportunities for improvement can also be encountered during the journey of this academic analysis. The universality of human rights, and especially the right to human dignity, constitutes the cornerstone of international human rights law, thus contributing to international community’s development. Although they are supposed to be inviolable, inalienable and no one can be treated in a degrading way, their inevitable embeddedness in each society’s context implies the need for the adoption of different approaches in order to combat inequality and fundamental rights’ violations. The present study is undertaken to explore the Greek case’s specific characteristics and factors influencing the country’s full compliance with its international, European and national human rights obligations, while the empirical analysis emphasizes on nuances which are not explicitly evident at theoretical level. Thereafter, the paper aims to hopefully reveal the dynamics of a chain of interrelated factors, stress the importance of refugees’ protection and provide an academic approach of the most crucial current phenomenon which international community, and in particular Europe, has to deal with. In the aftermath of the Syrian crisis, many people, having suffered the violence within their state and the internal conflict which has been transformed into a crisis with international dimensions affecting international peace and security, start the hazardous journey in search of a better and safer future. However, their background as refugees does not presuppose a welcome reception on behalf of many European countries (The Guardian 2016). It is the countries of the Southeast Europe who suffer the burden of the refugee inflows, and especially Greece which is left alone to provide humanitarian support to those people despite the severe financial crisis that is being through. Indeed, Greece is the country-bridge which connects Europe with Asia and Middle East and as a result, any refugee has to pass through the Greek territory in order to reach Europe. Therefore, it constitutes a transit country where thousands of people are temporarily hosted until their identification and asylum process is completed. In 2016, there were recorded more than 173,450 sea arrivals, while the first months of 2017 the number decreased to 43,807 people with 44% of them coming from Syria (UNHCR 2017a). By the time of the present research, thousands of refugees cross the Greek borders from Turkey suggesting that arrivals have not been prevented even by the EU-Turkey agreement, but on the contrary continue on an upward trend (Deutsche Welle 2016). This has caused high migratory pressure to the Greek government due to the disproportion between large numbers of Syrian refugees and the capacities of reception centers. Consequently, the country has shouldered the difficult role of providing them a temporary shelter, food and medical assistance through the creation of refugee camps. However, although the Greek government tries to comply with its international and European obligations, various social, economic and institutional challenges constitute non-negligible factors impeding the efficient provision for Syrian refugees (Human Rights Watch Report 2016). The country was neither institutionally nor structurally prepared to accept this unprecedented phenomenon and operate in accordance with international human rights standards. Most of the asylum seekers are facing not only chaotic registration procedures but also inadequate accommodation conditions due to the inability of the state to provide the necessary reception facilities, a fact which is directly related to the undermining of their human dignity. Indeed, Syrian refugees have no access to hygiene, clean water, food or information about the stage at which their asylum application process is. In addition, most of the reception centers are overcrowded leading to the lack of privacy, and especially for families, since refugees are obliged to share small areas with others (Amnesty International Report 2016). These conditions do not meet international standards and undermine their dignity, a fundamental right which accrues to every human being. Consequently, the settlement in lodgings below international human rights standards constitutes one of the most important challenges that Syrian people have to face when they enter the Greek territory. In other words, given the national economic instability in conjunction with signs of racism from a part of the population and the lack of a common European policy, the domestic implementation of international human rights law is deeply affected by the specific cultural, economic and social context and this is quite relevant in the case of the Greek government’s struggle to receive thousands of Syrians every day. Nevertheless, it is worthwhile clarifying that since 2016, the living conditions for Syrian refugees have significantly been improved thanks to the valuable contribution of transnational actors as well as private initiatives and donations. How does the Syrian refugees’ treatment by the Greek government affect their right to dignity in reception centers with particular regard to adequate living conditions and what is being done to improve their situation from rights-based perspective? To answer the research question, I will first argue that refugees’ fundamental rights, such as an adequate standard of living and consequently human dignity, are institutionally and legally provided on paper, entailing certain obligations as well as expectations for the states. Sub-questions related to the role of the relevant actors, expectations from authorities and Syrians’ experiences might serve as a research guide for further empirical investigation regarding the challenges that Syrian refugees are facing within reception centers through a rights-based approach. Thus, when I examine the domestic implementation of international human rights law, I deploy the theory of these norms’ translation into national and local level as described by Merry (2006), while simultaneously arguing that the integration and institutionalization of universal ideas does not constitute an easy process but consists of stages which require time, political will and the auxiliary role of transnational actors (Risse et al. 1999). Referring to the factors influencing the Greek government’s response, makes the theoretical approach more specific since when analysing a social problem, the variety of economic, political and social contexts ought to be taken into consideration. As a result, the economic plight and the Greek culture as a national essence can shed light on the deeper roots of authorities’ inability to effectively manage the large numbers of refugees, becoming a connection between the theory and reality on the ground. Since the objective of the present study is to examine the extent to which Syrian refugees’ dignity is protected in the government-run reception centres and their treatment by various state or non-state actors, the paper is divided into two main angles including the theoretical approach of this issue and the fieldwork conducted in one of the reception centres of Athens. Drawing from the relevant literature regarding the country’s legal obligations at international, European and national level, I will try to approach human dignity in the sense of the adequate living standards and analyse its compliance with human rights norms. Therefore, I will argue that international principles’ integration within society is dependent on the latter’s social, economic or political context. By referring to the factors influencing Greece’s response to the refugee issue, I aim to stress the government’s limited capacity in ensuring a decent treatment for those people. Given my initial theoretical assumptions, I was expecting to find results leading towards this direction and confirming that indeed Syrian refugees’ dignity is violated by the dire conditions within camps, but during the process unexpectedly remarkable findings emerged. Indeed, the fieldwork in conjunction with the valuable experience that I gained from my visit and discussions with key informants constitute a significant source of analytical tools which will be used to analyse the research topic. Although I did not conduct a wide variety of interviews, I had the opportunity to collect remarkably important material and captivating stories, while I have been able to unpack and interpret many people’s silence or reluctance to express their viewpoint. More specifically, I conducted twenty-two semi-structured interviews with Greek authorities and NGOs’ representatives, journalists, local people and Syrian refugees hosted in the reception centre of Eleonas as well as proper apartments. Some interviews included families or group discussions and although there was a number of specific questions, they seemed to be a kind of conversation between friends or people familiar with each other. Conviviality and the exchange of honest viewpoints facilitated the process, while in the cases of government officials and NGOs’ spokespersons the sense of professionalism was prevailing. Apart from the relevant literature which is used to approach Syrian refugees’ treatment in Greece through a human rights perspective, it was observed a scarcity of academic literature concerning particularly the current refugee issue in Greece. This gap had to be filled with other sources, such as statistical information and reports, online articles and publications, research articles and refugee journals. These empirical data constituted the starting point for my gaining a better insight on the issue under research before conducting the fieldwork. Every source of information has contributed to the comprehension of Syrian refugees’ treatment, the potential deficiencies and weaknesses of the Greek public policy as well as the dynamics of the relationship between the two sides. The present study constitutes one of the most crucial and controversial current issues afflicting international community and particularly the Greek society. The refugee issue itself poses certain limitations which are evident in the chosen unit of analysis related to living standards within reception centers and their impact on Syrian refugees’ human dignity. It would be, therefore, important for the research to concentrate on official open reception centers where Syrians are temporarily hosted and as a result, the fieldwork has taken place in the camp of Eleonas in Athens. Considering that the eastern islands of Greece have extensively been subjected to publicity due to the proximity with Turkey and their forming as the first stop of asylum seekers in order to reach the capital and later another European country. Even in Athens, most of Syrian refugees accommodating in reception centers are hosted in Eleonas since, as it will be argued, the vast majority of them benefit from the Relocation Scheme and Emergency Response Programme facilitated by the UNHCR and Praksis. Thus, it was preferable for the research to focus on the specific reception center and examine the chain of relationships and factors influencing Syrian refugees’ temporary accommodation in Greece. This constituted one basic challenge, and consequently limitation to the present study, since seeking to find Syrians in camps was not as easy as it seemed. In addition, the difficulty in approaching and convincing them through trust building to express their experiences was a factor which limited the research to a few but concise interviews. Ethical challenges prevailed since those people could not be treated simply as a research object due to their experience of conflict, displacement and suffering of human rights violations (Jacobsen and Landau 2003: 1). Thus, conducting the research without harming those people constitutes a dual imperative which, according to Jacobsen and Landau, is explained as the need to satisfy the research’s demands but also ensure that the outcome protects refugees (Ibid: 2). Although the collection of data often depended on the respondents’ character and willingness to talk about living conditions, every piece of information- even silence- reveals various and significant aspects of the issue. Limitations are also referred to government and non-governmental organizations’ representatives. Their excessive workload and responsibilities affected their availability to be interviewed and despite any persistence for an appointment with the relevant spokespersons, the fieldwork was strictly based on the primary actors involved in ensuring refugees’ dignity in the country. In order to address these limitations, information from other sources and data cross-referencing, such as NGOs’ websites, were gathered. Even if they might not attribute a prestige as an interview would do, their accuracy and useful information render the academic analysis feasible. Defining human dignity through the lenses of the right to adequate living standards can be an analytical tool to reveal and examine the complexity of power relationships as well as the various factors whose non-negligible role affects this complexity. Chapter 2 exposes the legal framework in which dignified living conditions are guaranteed for refugees through relevant provisions in international, European and national documents. Greece is bound by treaties and regulations suggesting its legal obligations towards people seeking asylum and international protection. Chapter 3 explores the process of international human rights norms’ implementation into society by explaining the dynamics of this relationship and the role of various actors in the realization and effective institutionalization of these principles. Having presented the legal framework and theoretical approach of human rights’ implementation, in the fourth chapter the paper focuses on the findings regarding living conditions for Syrian refugees, specifically in the reception center of Eleonas. The fieldwork conducted sheds light on the issue of reception facilities, thus constituting an indispensable empirical tool for the paper’s analysis. Furthermore, the input of witnesses and interviews with key informants, such as government officials, volunteers and refugees, provides further support to the writer’s arguments and contributes to the research’s validity. Finally, chapter 5 might constitute the most important part of the present study since it presents an in-depth analysis of the relationship between theory and practice, expectations and realizations. Through this process, further implications and conclusions regarding Syrian refugees’ right to human dignity within the Greek reception centers can be easily extracted. As a result, the structure of the paper aims to provide the reader a better insight of the current situation under which Syrian refugees are currently living, the potential initiatives promoted by the Greek government as well as the dynamics of the relationship between human rights values and their domestic institutionalization. International community consists of a mosaic of various cultural and moral values as well as different visions regarding the sense of good life. Despite the controversial debate between the partisans of universalism and relativism of human rights, values like the respect of life, equality and dignity are without a doubt common to all human beings. They are considered to be unalienable, while their deprivation could in fact lead to both the undermining of human nature and the low levels of a human rights’ culture promotion within society. Put differently, although universalism might take many forms, rights with a more general content are universally binding to all societies regardless any cultural, economic or social differences among states. Perhaps, the most fundamental postulate accruing to every individual is the right to equal human dignity whose denial could shatter universalism in the sense of human rights corpus (Steiner 2008: 519). Nevertheless, certain groups or individuals have not the opportunity to exercise their right to an adequate standard of living due to their identity and mainly when they belong to vulnerable groups such as refugees. Because of their legal status, they are often unable to ensure appropriate housing for themselves and consequently they are forced to live under precarious and insecure conditions in reception centers. Inadequate sanitation, overcrowded and poor ventilated dormitories consist only a few of the challenges for many refugees, depriving their dignity as human beings. In the case of the Greek policy regarding the accommodation of Syrian refugees, there is a range of international, regional and national laws which recognize this fundamental right and provide policy guidance for the government to realize and ensure this right within reception centers. Discussion on the legal framework for refugees’ right to human dignity with particular regard to adequate living standards outlined below intends to illustrate the relationship between the provisions of various legal documents and their implementation in practice. The main objective of the Declaration is to invite all countries to comply with fundamental human rights principles, reaffirming its faith in them and particularly in the dignity of every human being. This principle constitutes now an integral part of the international customary law, while it is directly related to the right to an adequate standard of living. Indeed, an individual or group’s dignity is undermined when the accommodation conditions are deemed to be dire in the sense that they impede the realization of a decent living and raise the issue of their survival. Since dignity is approached through the right to an adequate standard of living, the Article 25 of the Declaration suggests that this right should include housing, food, medical care and every necessary social service which ensures peoples’ health and well-being (UNDHR 1948). In addition, every person -including refugees- is entitled to the realization of their social rights indispensable for dignity and their personality’s development (Ibid). The recognition of the refugee status does not deprive their identity as human beings and consequently the realization of every right accruing to them. Whether a person constitutes a refugee or not, they always have certain unalienable rights which need to be fully protected by every country. These principles constitute the core of rights and if they are not promoted, there is little to be expected for the realization of the rest of the rights. Considering that the Declaration of Human Rights is not a binding treaty and does not enforce the implementation of its provisions by the states, its declarative character suggests that certain norms’ implementation is left to the governments’ good will. Consequently, since Greece is supposed to be a developed and democratic state, it is necessary to treat people, including refugees, in a way that ensures their fundamental right to dignity. The Geneva Convention, which was adopted in 1951 and entered into force in 1954, constitutes the cornerstone of the refugee protection today. Although its scope was strictly limited to persons fleeing events within Europe before 1 January 1951, the Protocol of 1967 removed all these limitations and as a result, the Convention obtained universal coverage providing protection to every person which meets the criteria and falls into the refugee definition. The Convention establishes the minimum standards for the treatment of those people, without prejudice and discrimination from the member states which receive refugees into their territory. In particular, Greece constitutes a member state of this Convention and consequently has certain obligations regarding Syrian refugees and specifically their right to adequate reception facilities. Refugees should receive the same treatment as is accorded to both aliens and nationals in general and according to the principle of reciprocity in order their rights and benefits to be fully respected (UNHCR 2016b). One of the most fundamental rights is related to refugees’ accommodation which is provided under Article 21 suggesting that states ought to treat those people as favorably as possible and ensure their decent stay within their territory. Although it does not provide an explicit definition or explanation of what “favorable treatment” means, there is an inviolable obligation for the state parties emerging from this Article at least not to discriminate against refugees. Nevertheless, interpreting the Refugee Convention highly depends on the degree of acceptance by the state parties since there might be inconsistencies in relation to the wide variety of national jurisdictions (Goodwin-Gill et al. 2007: 28). Due to these inconsistencies, the main challenge not only of this Convention but also of every legal document is their consistent and uniform interpretation as well as integration within national legal systems. The Geneva Convention is considered the most significant binding legal document which protects fundamental rights of refugees and it is, therefore, implied a need for the adoption of a human rights approach in order to be domestically implemented. As a member state of the European Union, Greece has also regional legal obligations apart from the international level. The Union was founded to bring closer states under universal moral values such as solidarity, equality and human dignity. In every treaty or declaration, the individual is at the heart of any activity on behalf of the European countries and fundamental human rights are promoted through the compliance with the rule of law and the preservation of the declared common values. Nevertheless, there is not specific reference to refugees in the Charter of the European Union and the Convention on Human Rights. These documents emphasize the importance of the principles of freedom, security and justice for every person, resulting to the inclusion of refugees since they belong to the broader sense of the term ‘individual’. Thus, provisions regarding this specific group are only adopted through certain European Directives in order to establish minimum standards for the treatment of refugees by the member states. However, most of the provisions’ ambiguity is a common phenomenon which might constitute an excuse for governments not to comply with their international and European obligations. Indeed, the absence of reference to refugees in many European documents as well as the lack of an explicit analysis of the minimum living standards for refugees within member states’ dominion permits various interpretations. The following paragraphs refer to specific articles at European level related to the right to an adequate standard of living and the fundamental right to human dignity, creating legal and moral obligations for Greece in relation to Syrian refugees. The Charter basically reaffirms the rights deriving from the constitutional traditions as well as international and European obligations for the member states and various treaties such as the European Convention for the Protection of Human Rights and Fundamental Freedoms. Indeed, these rights provided in the Charter entail duties and responsibilities for the European governments with regard to other persons despite the social group or status they belong to. Greece, as a European country, is responsible for the compliance and effective implementation of the human rights principles provided at this regional level since the refugee arrivals have deeply affected most of the European states. Even at this level, human dignity is the most fundamental right, protected under the Article 1 of this Charter (Official Journal of the European Communities 2000: 9). Moreover, according to Article 34, every person moving legally within the European Union is entitled to benefits and social assistance such as housing and accommodation when they lack sufficient resources (Ibid: 16). Indeed, Syrian refugees have risked their lives to reach Europe, having abandoned their properties behind and seeking to find a safer place and future. They lack not only material but also financial resources, a fact which urges the European governments to take care of refugees by providing them a minimum standard of reception conditions within their territory. However, like the Universal Declaration of Human Rights, the European Charter is mainly declarative suggesting the pathway for the member states in order to achieve fruitful cooperation among them and development by respecting basic human rights norms. Due to this declarative character, the achievement of the desired outcome depends on the rules laid down by national laws and practices, provided that they are adopted in accordance to the Community law. The Convention’s provisions are applied to every human being by not distinguishing refugees from other categories since they are included in the broader sense of the word. Thus, refugees are considered to belong to the broad category of people and their rights are fully protected under the articles of the European Convention on Human Rights. Article 3 of the Convention could be related to the specific group of refugees since it prohibits any form of inhuman and degrading treatment (ECHR 1950: 6), while Article 8 guarantees the right to respect for private and family life (Ibid: 10). Indeed, there is a general obligation of the states to take all reasonable measures to protect individuals from any form of harm and treatment undermining their dignity. Refugees’ physical and moral integrity constitutes an integral element of private life (Lambert 2005: 43). Nevertheless, the challenges that Syrian refugees are facing within the Greek reception centers and the lack of privacy or treatment equally to nationals hinders the effective implementation of Article 3 of the Convention. When individuals, including refugees, lack benefits and material services fundamental for their survival, such as adequate food provision, information and decent accommodation, they are being subjected to degrading treatment undermining their dignity as equal and independent individuals. Since the Convention does not guarantee certain socio-economic rights such as the right of individuals- and consequently refugees- to claim assistance from a state to maintain an adequate standard of living, poor living conditions might raise an issue under Article 3 if they undermine human dignity (Ibid: 50). Indeed, considering the fact that Syrian refugees are being detained within the reception centers and deprived their liberty, the conditions ought to be at least compatible with their dignity. According to Lambert (2005: 49), the European Convention on Human Rights could potentially evolve into a true instrument of effective protection for refugees with particular regard to safeguarding their basic rights when they are present in the territory of a contracting party, but this could be achieved under the precondition of strong political will on behalf of the member states to introduce explicit provisions regarding refugees, sacrificing their national interests. Finally, the fact that the Convention applies to every human being, including specific groups such as refugees, leads the European Court of Human Rights to recognize an implicit duty of the member states to protect refugees under the Convention on Human Rights. Despite the ambiguity of this legal document’s articles, it could constitute a prospect for the inclusion of provisions with particular regard to refugees’ rights and their treatment by the contracting states (Lambert 2005: 52). According to Article 17 of this Directive, member states should provide to applicants for international protection adequate material reception conditions which guarantee their subsistence and protect their physical and mental health (Official Journal of the European Union 2013: 104). Article 18 becomes more specific by referring to the forms of housing which might be provided to refugees. They can be hosted in private houses, flats and hotels as well as reception centers which are supposed to guarantee an adequate standard of living (Ibid: 105). Nevertheless, although the Directive provides general instructions related to the reception conditions for the refugees seeking international protection, it does not explicitly analyze the minimum level of conditions as well as the specific services required, leaving this issue to the governments’ discretion. Thus, there is not a widely accepted level of reception facilities and states can claim that they comply with their obligations according to their capacities. Greek government officials can, therefore, claim that they provide accommodation conditions in accordance with both European and international standards. Although these standards are not explicitly mentioned in most of the treaties, they should contribute at least to the respect of refugees’ dignity. Having exposed Greece’s international and European human rights’ obligations, the reference to the national legislation is of imperative importance for the present study. Considering that Greece has historically been a host country for many people seeking international protection and consequently the status of refugees, it has adopted a series of laws and presidential decrees providing guidelines on the asylum processes as well as their accommodation within the Greek territory. Indeed, certain laws adopted by the respective governments are specifically related to the first reception services. However, many Syrian refugees have not been provided substantial assistance, and material reception conditions do not meet international standards notwithstanding the country’s legal commitments. Despite the factors which might impede the effective implementation of the legal provisions, it should be mentioned that national laws and regulations regarding the reception conditions for refugees provide the technical specifications regarding refugees’ accommodation and constitute a useful guideline for the Greek government to deal with the refugee issue. This law constitutes a transposition of the provisions of Directive 2008/115/EC “on common standards and procedures in member states for returning illegally staying third-country nationals” into the Greek legislation. Consequently, European standards regarding refugees’ reception are incorporated into the Greek context through the adoption of this law. In particular, the country is committed to set a minimum standard of reception facilities and provide a decent treatment for refugees. Article 6 of this regulation suggests that the ultimate mission of the First Reception Service is to effectively manage the inflows of third-country nationals in the country under conditions that respect their dignity (EDAL 2011). Furthermore, under Article 13, persons who enter the national borders shall compulsory remain within the First Reception Centers –or temporary reception centers which are established when the existing facilities are not enough to cope with the number of third-country nationals until the identification and asylum process is completed (Ibid: 19). Although in the same article it is suggested that decent living conditions are necessary during third-country nationals’- and consequently refugees- accommodation in those centers, still the ambiguity of these provisions hinders the explicit reference to specific facilities which are considered fundamental for those people’s dignified temporary accommodation. Access to hygiene, food and other material services are totally omitted by taking for granted that they ought to be provided. However, the current refugee issue suggests that there are quite many deficiencies, a fact which is going to be analyzed in the present paper through the evidence collection regarding Syrian refugees’ accommodation in the reception centers. Nevertheless, it should be noted that the Law 3907/2011 was amended by the Presidential Decree 133/2013 which provided the creation of regional asylum offices in many cities across the country including the islands of the eastern Aegean Sea, Lesvos, Chios, Samos, Rhodes and Leros (National Gazette 2013: 3193). According to this amendment, these islands are now being able to host refugees crossing the Greek borders from Turkey and provide them a temporary accommodation. The objective of this Decision is the regulation of issues regarding the internal structure and operation regional initial reception services through the explicitly mentioned duties of the personnel within the centers. The reference to this National Decision seeks to point out the distance between reality on the ground and the declared organizational and administrative services. Article 4 provides a detailed explanation of the necessary material and technical equipment within the reception centers through specific articles related to food distribution, cleaning, medical material and blankets (National Gazette 2012: 2). Specifically, medical treatment includes general clinical examination, the keeping of medical record for every refugee as well as the maintenance of all hygiene rules within the reception centers. In addition, in the same Article, it is suggested the administration of a pharmacy in constant cooperation with doctors, while the fourth paragraph provides specific reference to the establishment of Information Team responsible for providing to third-country nationals informative booklets regarding their rights and obligations (Ibid: 3). This National Decision provides a detailed reference to the existence of distinct areas which are essential within the first reception centers. Specifically, under Article 6 every center shall be equipped with decent accommodation dormitories, medical consultation room or infirmary, a restaurant, recreational activities and religious worships for all religions and doctrines (Ibid). Furthermore, the centers ought to provide interview rooms and secretariat area where meetings with lawyers, Civil Society institutions and management of asylum processes may take place. The exact dimensions of those areas are fully included in Article 20 which constitutes an Annex related to general specifications of the regional initial reception services. Article 11 includes an even more specific explanation of the facilities and benefits which ought to be provided to persons subjected to the initial reception procedure. For instance, meals and a well-lighted, heated and aired accommodation should be daily offered, while they are supplied with clothes and units necessary for their personal hygiene (National Gazette 2012: 6). It is, therefore, observed that this National Decision constitutes a useful and illustrative manual which provides general instructions by setting the minimum standards essential for every person seeking protection in Greece. The massive refugee arrivals undoubtedly have significant impact on the European states’ economies. The various economic systems and the existing disparities in the Eurozone illustrate the levels of national response as well as the different capabilities that each state has in dealing with this phenomenon and providing a dignified accommodation to refugees. The so-called refugee crisis does not reflect equal gains and losses for all European countries. Given the deep financial crisis that Greece is being through and the existing strains of austerity, the refugee issue is not only testing the limits of the country’s already exhausted economy but also revealing the potential institutional and bureaucratic deficiencies regarding the effective protection of Syrian refugees’ dignity. More specifically, as Yiannis Stournaras, the governor of the Bank of Greece has noted, the increased public spending to absorb thousands of refugees arriving daily in Greece will amount 600 million euros at a time of strict national fiscal policy (The Huffington Post 2016). Although many Syrian refugees consider Greece as an entry point in order to reach wealthier European countries, the fact that they remain in the Greek territory entails that those people are entitled to certain fundamental and internationally recognized rights such as accommodation, food and healthcare. The government’s commitment to comply with its international and European obligations by ensuring these rights implies more national expenses at a time when the welfare system is not able to protect even its own citizens and the country is suffering from the successively collapsed political leaderships. The Greek authorities’ inability to effectively integrate international human rights standards and sufficiently protect Syrian refugees’ dignity within reception centers could, therefore, be attributed to the implementation of huge spending cuts and the dramatic reduction of the public sector’s productivity and efficiency (Europe Newsweek 2016). Without receiving adequate financial and political support from the European Union, Greece – a bankrupt state- is therefore struggling to develop a mechanism in order to manage the large number of refugee arrivals (The Huffington Post 2016). However, even if the financial assistance from the European Union was higher, it would be quite naïve to believe that the Greek bureaucracy could perform better since the shrinking of the public sector has led to an extremely reduced number of staff while there are not enough initiatives for further vocational training according to the current challenges of the refugee issue (Ibid). Consequently, inadequate training in conjunction with the lack of communication among state agencies affects not only the asylum processes but also the government’s ability to ensure Syrian refugees’ fundamental right to a decent standard of living. Added to the strict austerity policy, there has been a grounded fear that the new waves of refugees might revive signs of anti-refugee racism. The scarcity of job opportunities due to the austerity measures and the country’s general economic plight generates racist trends from a part of the population since third-country national are considered as a threat against Greek citizens’ potential career (ELIAMEP 2014: 26). The exceptionally high unemployment rates have led to a common perception that refugees- including migrants- burden the government by both invading the Greek economy “stealing” jobs from the native population and demanding subsidies or other forms of economic assistance. It is generally believed that behind the refugee identity there is a wave of labour migrants seeking to find a better future in the country and contributing to the impairment of citizens’ economic situation. 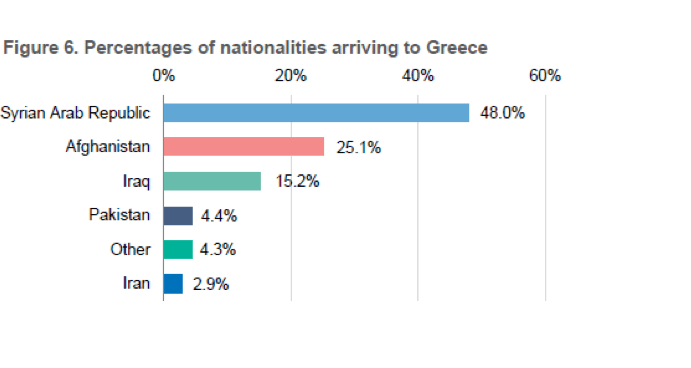 Since cheap labour is preferred, many Greek nationals are facing the risk of unemployment (Ibid). Furthermore, intolerance and xenophobic trends against refugees are also reinforced due to many criminal incidents –basically caused by illegal migrants. Since local people are not aware of the distinction between refugees and migrants as well as the international human rights standards- the lack of awareness is highly related to the ineffective domestic translation and implementation of international norms-, they consider asylum seekers as a threat against internal security (Papadopoulou 2004: 180). Drawing from these incidents, the Greek population’s understanding of culture as a national essence and historical superiority is reinforced. Every ethnicity different from the Greek is often suspiciously treated and deemed to threaten not only society’s security but also the Greek culture’s homogeneity. Admittedly, each nation has its own history and culture expressing its genius, but when this national essence becomes integral part of ethnonationalism and indigenous sovereignty, it is often in resistance to human rights (Merry 2006: 14). This notion is reflected on the governments’ reluctance to energetically intervene and protect refugees’ fundamental rights, claiming to defend national identity. Pandering to a simplistic nationalism illustrates the destructive notion of “us” versus “them”, while it contributes to the rise of prejudice levels and fear against whatever is not familiar to citizens’ culture. Discrimination and restrictions on the basis of religion or ethnicity often occur under the tolerance of the state authorities which either turn a blind eye or are reluctant to actively participate in improving the sub-standard living conditions within reception centers. Greece has often been criticized for the absence of effective administrative infrastructures as well as a comprehensive plan for protecting refugees’ dignity, and as Papadopoulou clearly mentions (2004: 171), the state policy consists of the oxymoron of providing humanitarian assistance and temporary reception facilities but with the aim of deporting refugees and preventing permanent settlements. Indeed, the existing facilities and services within reception centers are not able to cover basic needs of the refugee population such as hygiene, privacy and food distribution. It has, therefore, been observed a deliberate intention from the respective Greek governments to link the country with a temporary character and make it as a “waiting room” for many refugees in order to avoid integrating the within society. In order to avoid potential social disputes or disturb established hierarchies in view of the country’s existing economic plight, authorities often make compromises even if they undermine human rights values. As a result, third country nationals are subjected not only to inhuman living conditions but also to a period of uncertainty, vulnerability and socio-economic marginalization, while their survival basically depends on individual efforts such as NGOs and the local population. Notwithstanding, in view of the Syrian conflict, there has been observed a gradual attenuation of this notion. Local people have welcomed refugees by mobilizing every means to save their lives from sinking boats across the sea borders with Turkey and treat them as equal human beings. Having also lived the nightmare of being refugees in the past, more than 5 million Greeks have demonstrated remarkable solidarity by providing meals and first aid care, while private donations in various reception centers illustrate local people’s generosity seeking to cover the government’s absence (Europe News Week 2016). Therefore, in view of the state’s inaction, the survival of thousands of Syrian refugees depends on local people’s determination and willpower who are making significantly great efforts to ensure a dignified accommodation for refugees in reception centers. According to many citizens, this phenomenon is considered as an instance for Greeks to show that they are different from what has been portrayed in the global media during the recent years (Ibid). Consequently, local people’s contribution to the respect of Syrian refugees’ dignity constitutes a non-negligible factor which should not be disregarded, suggesting that the doctrine of intolerance and racism is gradually being eliminated. Last but not least, it would be worthwhile mentioning that racism against refugees is not a challenge only for Greece but for the whole European Union. The current refugee issue suggests the existence of a gap between declarations about non-discrimination, freedom and democracy, and reality on the ground. Undoubtedly, the refusal of many countries, through the closure of their borders, to accept refugees into their territory entails sings of racism, while the building of fences across borders with Greece challenge these founding values of the Union. In particular, Poland, Czech Republic, Austria and Slovakia are rejecting any calls to impose immigrant resettlement quotas, overburdening Greece but also causing a political turmoil in Europe. Despite the emergency assistance of over 181 million euros to Greece since the beginning of 2015 (European Commission 2016), and certain European leaders’ declarations to provide shelter for Syrians fleeing war and persecution (Reuters 2016), it is observed that the European Union’s promptness to financially assist the Greek government is not enough. For many European governments, building fences constitutes a legal practice in order to control third country nationals who enter their territory, thus trapping thousands of refugees in Greece which is de facto unable to cope with such huge numbers of asylum seekers. Particularly, according to Amnesty International (2014), millions of euros have been invested in fences, detention centres as well as the creation of a buffer zone in Europe’s external borderlines, underlining the member states’ intention to adopt policies of prevention instead of management and protection. Since most of the states seek to preserve their national control and sovereignty, a substantial harmonization of the different policies is not easily achieved. Therefore, these practices result in the unjust distribution of refugees among member states and overburden southern states like Greece, creating imbalance and tensions within the European Union (Höfner 2015: 4). The political will of all member states is essential in order to find viable solutions and respect human dignity instead of seeking to stem those unavoidable arrivals. The financial assistance towards Greece without political willingness for cooperation among European governments could be considered as a temporary substitute for the Union to avoid taking responsibility and leaving Greece alone to handle such a humanitarian crisis. Although the European Union was deemed as an intergovernmental society of different cultures, racist sentiments and attitudes against foreigners prove the political reluctance for cooperation in times of crisis leading to a conspicuous contradiction with the declared democratic and liberal principles (Höfner 2015: 4). As the German Chancellor, Angela Merkel, had stated “if Europe fails on the refugee question, it will no longer be the Europe we dreamed of since its bonds with universal rights will be destroyed” (Independent 2015). Demanding from an already overburdened country such as Greece to protect Syrians, when at the same time most of the member states fail to realize their obligations and protect them, suggests that the European Union cannot implement the principles it preaches. Moreover, the absence of a comprehensive asylum policy undermines the Union’s capacity to effectively manage this issue, implying that the protection of refugees’ rights constitutes a second order priority for Europe (Höfner 2015: 6). The Union is deemed to be observant lacking significant political willingness and cooperation to find a viable solution and putting its hopes in Greece to stem Syrian refugees fleeing war. Considering that living conditions depend to a great extent on the degree of economic and social activities, Greece is in a condition of a semi-protection of Syrian refugees. Indeed, it has been awarded with large amounts of financial assistance as an emergency funding, but the absence of a comprehensive cooperation at European level leads to the overburden of the country and its inability to conform with its international human rights obligations. The case of Greece illustrates that there are certain limitations even to universal values’ domestic implementation such as the dignified treatment. They might conflict and be prioritized differently by various societies, depending on their moral and cultural life as well as the degree to which they can foster a human rights culture (Parekh 2005: 285). Admittedly, since the level of realizing human rights depends on each state or society, there is not a single model towards this direction even for universal principles, and although they constitute absolute norms they need to be adapted according to specific contexts. Consequently, the question of human rights’ translation is reasonably raised and this analysis is considered more than significant in order to gain a better insight on the issue of Syrian refugees’ dignity within the Greek reception centers. To begin with, it is often stated that international and national systems are not synchronized, while it is questioned whether international norms are automatically integrated into a state’s legal system or not, raising the issue of the relationship between these two levels. Although human rights standards under conventional and customary law should operate directly within national legal systems, the common phenomenon of human rights violations could be attributed to certain limitations. Indeed, these violations are considered to emerge from the state which is depicted as savage and those rights’ violator. However, states consist of ordinary people forming governments who have their own perceptions regarding rights and as a result, the maintenance of these notions when they occupy official government positions is unavoidable. Thus, it would be of great interest to analyze how international human rights principles are packaged into familiar for ordinary people concepts and translated into the national and local level in order to understand how it can affect the Greek government’s response in ensuring Syrian refugees’ dignity. Contradictions between reality and Greece’s commitments to equal and dignified treatment need to be confronted under the guise of a continuous struggle in political, cultural and economic arenas. Human rights constitute ideas developed in global settings but they are selectively picked up or rejected by governments according to a plethora of political or cultural factors. Remaking human rights and transferring them to national and local level is, therefore, difficult due to the fact that transnational legal culture is often remoted from local contexts where human rights violations occur (Merry 2006: 1). In addition, transnational actors seem to be reluctant to take complicated local contexts into consideration when formulating and codifying international human rights norms, and thus they, deliberately or not, ignore each society’s specific needs. This theoretical distance affects universal norms which are unavoidably embedded not only in cultural assumptions about the nature of the state and the person but also in the national economic and political context. Consequently, it is essential for human rights ideas to become part of ordinary people’s consciousness in order the latter to understand or modify the way they perceive themselves and other individuals in terms of human rights (Ibid: 3). However, this is not an easy process and the intermediary role of various NGOs and activists is considered more than necessary since they remake transnational discourses into the vernacular and vice versa by framing national needs into international human rights language (Ibid). In particular, in order human rights standards- such as refugees’ dignity- to be reinforced and persuasive, they need to be framed in local values and challenge existing power relationships. If these values are compatible with the existing ways of thinking within the Greek society, they cannot lead to social and institutional change. On the other hand, as Merry states (2009: 134), framing these ideas into familiar terms in fact constitutes ways of packaging and presenting ideas that generate shared beliefs and mobilize collective action. They need to be translated into terms familiar to ordinary people who are not able to participate in the decision making policies and might not be aware of their rights as well as their legal obligations. Since human rights law promotes universal values, their integration at national or local level would be better achieved through the promotion of a human rights culture. Here, it should be explained that when referring to ordinary people and individuals, politicians and government key officials are included since- as mentioned earlier- their nature as human beings implies the existence of different notions and perceptions. Thereafter, although human rights system might seem to challenge the state’s authority over its citizens, in fact the realization of certain social and economic rights, including the right to adequate living conditions, requires a strong state made of determined government officials who encourage relevant campaigns. As a result, individual rights consciousness is significant in bringing this mentality into local communities and creating a rights-based culture where dignity constitutes the cornerstone. The absence of a domestic human rights culture limits the impact of many treaties in societies, while the low level of universal norms’ domestic implementation can also be attributed to the absence of a supreme international authority which can supervise and enforce the states to comply with their legal obligations. These two factors are interdependent since the creation of a human rights culture puts aside the necessity for international supervision and vice versa. And again, this depends on other political, social and economic factors and a vicious circle is thus created, suggesting that the specific national context has a significant role in the effective implementation of universal values. But under which conditions are international human rights ideas internalized and integrated domestically? And which are the factors influencing the degree of those norms’ implementation? The ability of international human rights norms to change relevant practices at national level implies a causal relationship between them and consists of stages leading to this outcome. Admittedly, it is a common phenomenon for governments to conform with universal standards only to avoid economic or political sanctions, but in order them to become fully indigenized, to affect political transformation processes and become part of individual’s consciousness, the pathway is more complicated. Thus considering the different social, economic and political context of each state, the degree to which a human rights culture is promoted varies, but in every case there is one precondition; the establishment of the rule of law. Drawing from Risse and Sikkink’s five-phase “spiral model” (1999: 5), international human rights norms could lead to the change of domestic practices through the stages of instrumental adaptation, moral consciousness-raising, argumentation, dialogue and persuasion and finally, the process of institutionalization and habitualization. The special status of human rights norms related to a certain kind of appropriate behavior implies the distinction between liberal and non-liberal states, constituting a source of pressure and a primary incentive for states to instrumentally adopt universal principles. Admittedly, the inherent need of many states to be regarded as members of a community leads them to act according to a certain type of expectations, a perception which is prevalent in the case of Greece. Since the country is a member of the European Union, the government is obliged to respect and implement the human rights norms preached by the Union in order to ensure its inclusion into both the European and international community of the so-called “liberal democratic states”. When actors accept the moral validity of norms and are convinced that their interests are compatible with these ideas, then the second stage of moral consciousness-raising and persuasion could potentially be achieved (Risse et al. 1999: 14). Moreover, the last stage entails the alteration of existing ideas as well as expectations and the establishment of a “proper” behavior in accordance with international human rights principles. Consequently, the more governments engage in dialogue about human rights’ implementation, the more possible it is for them to institutionalize and integrate these norms within society. Considering that the Greek government itself is not able to manage the refugee arrivals, human rights advocacy through transnational actors has an essential role towards this direction. They usually consist of national and transnational elites such as experts and government representatives, lawyers or NGO leaders putting pressure on various governments to conform according to the norms promoted by the international community. Human rights advocates in conjunction with national institutions constitute the most important promoters of universal principles. Institutions are interrelated to rights-consciousness since the more the latter is developed the more pressure will be on institutions to take rights seriously (Merry 2006:5). Institutional and governmental structures as well as NGO activism constitute undoubtedly indispensable factors contributing to the effective transmission and adoption of international norms and regulations. Specifically, national human rights institutions have the opportunity not only to participate in forums and shape human rights norms but also to push the frontiers of these ideas and mobilize them within a state or society (Alston 2013: 1078). Their mediating role in the interface between the United Nations or regional level such as European Union and the relevant role players in various states is of imperative significance (Ibid: 1056). Consequently, if compliance with international standards is to be more effective, then it is essential for national human rights institutions to foster social change and mobilization in order to secure inviolable rights such as human dignity. Alliances between these national institutions and NGOs or activists could potentially function as an ideal combination for the promotion of a human rights-based culture. Thus, universal principles and the specific context of each society could be considered as a continuous process of negotiating ever-changing global and local norms, forming alternative societal structures and new ways through which dignity could be protected or enhanced (Merry 2006: 9). Nevertheless, even though human rights norms are translated into national or local contexts, they are never fully indigenized, retaining their fundamental grounding as a modernist understanding of the individual and emphasizing on autonomy, equality and human dignity (Merry 2009: 137). They are not built on preexisting cultural systems, but they are rather dressed in familiar costumes so they can be easily approached by ordinary people (Ibid: 138). As a result, the existing power relationships and models of thought can effectively change due to the unfamiliarity itself of these ideas, while they are effectively adopted by local people or a whole state only when these transnational principles are framed in familiar cultural terms. Taking all into consideration, human rights norms introduce a new dimension to the way individuals perceive themselves and the world, and they achieve their emancipatory potential only when they become part of people’s legal consciousness. It is widely accepted that Greece was neither economically nor institutionally prepared to manage and host the thousands of people who crossed its borders. While the government was busy with the challenges which society is facing due to the financial crisis, the refugee issue came as a surprise highlighting the already existing institutional and structural deficiencies. Refugees were trapped in an ill-prepared country where the appalling conditions within reception centers reinforced uncertainty and hopelessness. They are particularly discerned on the country’s eastern islands where the vast majority of refugees arriving in Greece are received and temporarily hosted and it is exactly the nature of those islands – they form the first stop of the refugees’ long journey- that creates the humiliating atmosphere. Those refugee camps did not preexist but constituted a makeshift solution to provide a refuge to thousands of innocent souls. After their reception, refugees are allocated into official reception centers across the country until their asylum in other European countries is approved. The humanitarian disaster could also be noticed in Athens, where squares and parks became a temporary refuge for those people, a fact which was attributed to the huge numbers exceeding the reception capacities as well as to the government’s poor organization and inability to allocate funds for migration and asylum policies (Human Rights Watch 2015). Failing to provide access to basic needs, such as healthcare and food (Human Rights Watch 2016), and identify those people’s vulnerabilities, the Greek government was assisted by various national actors and private initiatives in order to ensure a suitable accommodation for Syrian refugees, compatible with an adequate standard of living. These actors’ contribution is considered more than essential for the effective management of the large numbers of Syrians and the improvement of the living conditions within centers. Indeed, despite the surprise and unpreparedness of the Greek authorities, a compilation of findings suggests that since the beginning of 2016, the majority of reception centers have significantly been developed to ensure decent accommodation according to international human rights standards and consequently, to respect Syrian refugees’ dignity. Given the fact that international interest has concentrated more on the ad hoc and makeshift refugee camps on the eastern islands of Greece, it would be of imperative importance to examine what happens after the allocation of Syrians into official reception centers. Here, it is worthwhile noting that the vast majority of them has already left Greece either because they could afford the expensive journey to another European country or as beneficiaries of programs related to the Reunification of Refugee Families (UNHCR 2012). Thus, although Greece accommodates more than 61,000 refugees (Greek Reporter 2016), by the time of the present research, the number of Syrians within reception centers constitutes a small percentage in relation to other nationalities such as Afghans. Therefore, the research focuses on the center of Eleonas in Athens, where the majority of the remaining Syrian refugees is accommodated. It constitutes a case suggesting that the willingness and sensitization of private and other national or transnational actors have successfully contributed to the amelioration of living conditions and consequently, to the country’s compliance with its human rights obligations. Specifically, Eleonas is the first official camp created in 2015 in order to cope with the dramatically increasing numbers of refugees, and it is considered as an open reception center where residents are able to move freely during the day from 9 a.m. until 10.30 p.m. Located in a large area of junk yards, creating the scenery of a place for soil works, the inhabited and surprisingly quiet neighborhood provides no evidence for the existence of a refugee camp there. From the fieldwork conducted in Eleonas, it was observed that tents are replaced by mobile home units with necessary facilities such as air conditioning system, electricity, heating and private bathrooms, protecting residents from infectious diseases and the danger of health problems. Neighborhoods were distinguished according to the nationality or refugees’ status, e.g. family or single persons, seeking to avoid tensions and ensure the harmonic coexistence of different nationalities. Since the vast majority of Syrians benefits from the relevant relocation programs and are hosted in proper houses (The Huffington Post 2016), the inclusion of this aspect of their life in the present analysis will shed light on the initiatives implemented by various non-state actors and their significant role in assisting the Greek government to protect refugees. Particularly, the Relocation Scheme and Emergency Response Program started in November 2015, constituting the most successful initiative implemented by the non-governmental organization Praksis in cooperation with the UNHCR. Funded by the European Commission through the UNHCR to support Greece, it provides 20,000 additional places for asylum seekers in hotels, apartments or sharing houses with Greek families (European Commission 2015). Owners of various apartments sub-rent their properties to the UNHCR and Praksis in order the latter to dispose them for refugees’ accommodation. The fact that most of the beneficiaries are Syrians is attributed to publicity and awareness concerning the current events in Syria. Particularly, in order an asylum seeker to benefit from the Relocation Program, they need to meet certain criteria with the most important being the recognition of their refugee legal status. Considering that war in Syria has been converted into a human rights issue afflicting international community, Syrians are automatically recognized by most of the countries as refugees. Unlike other nationalities whose identification and asylum process is under consideration, Syrians’ legal status functions as a “boarding pass” permitting accessibility to social services and particularly to the Relocation Program. Furthermore, there is a small percentage of asylum seekers who receive the program’s services although they do not meet the criteria simply because they might belong to vulnerable groups (Praksis 2016b). According to information provided by the spokespersons of Praksis, since the beginning of this initiative, 5,080 asylum seekers have benefited consisting of 3,989 Syrians, that is 75,2% of the total population. The allocation into apartments is randomly conducted depending on the properties’ availability or the medical needs of each case. For instance, if frequent transfer to hospital is required, then those persons will be allocated into a relevant neighborhood. In addition, an apartment might host two families depending on its capacity as well as the composition of the family. Specific characteristics of each family are taken into consideration in order to achieve a homogenous and harmonic coexistence, thus illustrating the organization’s efforts to facilitate refugees’ accommodation in Greece and ensure a decent standard of living. Typically, the accommodation of beneficiaries in houses or hotels cannot exceed the two months until their asylum process is completed. However, the time limit has the flexibility to be extended depending on bureaucratic procedures and the huge numbers of asylum cases which need to be examined. Admittedly, the data mentioned above reflect the Greek government and transnational actors’ interest towards refugees, revealing non-negligible aspects regarding the whole management of the refugee issue. The following sub-sections present a compilation of witnesses regarding various actors’ perspectives, attributing a more representative nuance to the paper. According to the national law and regulations, in every reception center of Greece there is a government representative operating and coordinating the daily life of refugees (National Gazete 2012: 1), thus every project or initiative within the center of Eleonas is first approved and funded by the Ministry of Immigration Policy. Interviews with key informants such as the Coordinator of Eleonas’ camp, the Deputy Mayor of Athens, policemen and Military officers as well as one journalist present a remarkable amount of captivating information providing a better understanding about the center’s operation and the initiatives taken by the Greek government in order to ensure a decent and respectful standard of living for refugees. Although they did not hesitate to highlight potential weaknesses of the Greek asylum policy, all of them praised Eleonas by stating that it constitutes an exemplary work of both the government and transnational actors. As the Coordinator of Eleonas mentioned “there are many deficiencies in the reception centers, including the center of Eleonas, but we should not disregard the fact that Greece was asked to deal with large numbers of asylum seekers within only a few hours. Other European countries would need two months to construct a – more perfectionistic and well-organized- camp, but Greece was forced to do that in two days!”. The same viewpoint is also shared by Alexis Gaglias, a prominent journalist in the refugee issue, working for the news agency the Huffington Post. Having conducted a huge amount of research on reception centers, during the interview on 4th of August he reminisced his surprise when he first entered the camp in 2015. The constant presence of government’s representatives in Eleonas in conjunction with its well-organized management, including all its deficiencies (The Huffington Post 2015), led the journalist to the conclusion that “the refugee issue is the most successful sector of the Greek governance”. However, despite any sort of facilities provided to respect human dignity, refugees’ life itself will always have deficiencies in the sense that they are “people on the go” wishing to leave a host country like Greece. Notwithstanding, supportive attitude towards the government and the center of Eleonas’ infrastructures could sometimes lead to the opposite argumentative side, implying racist trends and oversimplified explanations. For instance, policemen interviewed on 11th of August seemed sarcastic and ironic by comparing the reception center to a luxurious hotel. They seemed to support the hitherto response of the government, implying that the facilities provided in the center of Eleonas advance Syrian refugees’ accommodation into a “luxury” in relation to other makeshift reception centers across the country. Statements such as “My parents were also refugees in the past but they did not have the facilities that Syrians are having now” were used to justify their arguments, while at the same time from their face expressions it could be drawn a sense of indifference and unawareness of the term “human rights standards”. This could be instinctively related to the issue of international norms’ translation and the absence of a human rights culture eliminating any sense of racism. Indeed, comparing refugees of different nationalities and in different times of the history is not feasible. The fact that their ancestors were not respectfully treated does not constitute an excuse for adopting the same attitude against third-country nationals. The facilities considered by policemen as a luxury are just the minimum preconditions respecting human dignity according to international human rights principles, but if they are not part of local people’s consciousness, the latter will not be able to alternate their viewpoint. Generally, it could be easily concluded that the center of Eleonas is not representative of the existing living conditions in many parts of Athens, but an exceptional example which should be followed by other camps in the country. This could be representatively expressed through Alexis Gaglias’ comment that “the center of Eleonas does not represent reality but embellishes it”. It might have been advanced into an outstanding model of reception center, distinguished from other camps, but this is the product of hard and time-consuming work. As the Coordinator of the center proudly stated, “despite the scarcity of staff, Greek authorities’ representatives give part of their soul, their physical presence within the center is evident and considering the experience we have gained as a country from this humanitarian crisis, the government’s response to the refugee question is constantly being improved”. The research was conducted in a period of excessive obligations and responsibilities for many NGOs and volunteers involved in the refugee issue. The massive refugee arrivals in Greece since 2015 indicated the necessity for NGOs and the UNHCR to work hard in order to provide decent reception conditions as well as to ensure that refugees’ dignity is thoroughly respected in accordance with international human rights norms. In view of the demanding reality and despite the repeated efforts to approach them and arrange an appointment, the reluctance of NGOs’ representatives to be interviewed and share valuable information could be justified by the high pressure conditions under which they are currently working. Hence, this aspect cannot influence or abridge the academic value of this analysis since the interviews conducted with the UNHCR and Praksis shed light on the current conditions under which Syrian refugees are hosted by revealing the dynamics of this issue, the achievements as well as potential weaknesses. The research in the reception center of Eleonas was facilitated by two community workers of the Greek Forum for Refugees, a program initiated by the UNHCR. The interview was conducted on 11th of August in a mobile home unit serving as secretary office, while their hospitality and the friendly atmosphere laid the foundations for a valuable and honest conversation. Although they observed that food distribution and lack of privacy constitute a constant source of complaints for most Syrians, they did not hesitate to state that “every actor involved in the smooth operation of the center is working to find the best possible solution”, by adding the significant role of psychologists and doctors’ permanent presence. Many times the two community workers intended to compare the camp of Eleonas to the rest of the city’s camps, seeking to explain the uniqueness of Eleonas. According to them, differences in living conditions among reception centers depend on the wide variety of nationalities as well as the level of education and culture. For instance, in camps where other nationalities are hosted, such as the former airport of Elliniko, small halls accommodate dozens of people under unsanitary conditions (Aljazeera 2016). “Here, the conditions are better since refugees do not live in tents and have a certain level of privacy since they can at least close the door or window”, they said. “In relation to my previous experience in other camps, when I came to Eleonas I thought that it could be considered as a five-stars hotel. Eleonas constitutes a model of infrastructures and a living example which should be followed by other camps!”, while they continued by concluding that “Without the Greek authorities’ contribution, Eleonas would not have been such a well-organized reception center”. On the other hand, the NGO Praksis’ spokespersons followed a more impartial line. During the interview on 18th of August, they focused on the organization’s projects and achievements concerning refugees’ housing as long as they stay in the Greek territory. The fact that the interview started with clarifications about the organization’s dissociation from the Greek government’s policy illustrated the actors’ different roles and the spokespersons’ imperative need to detach the organization’s work from any political interests. “Our relation with the government is indirect in the sense that bureaucratic procedures examining asylum requests might affect the Relocation Program’s efficiency and the time refugees benefit from it”, Praksis’ representatives explained. According to them, the notion of the Relocation Scheme and Emergency Response Programme is based on the need to ensure a dignified standard of living by covering basic needs such as housing, food and the interface with other social services aiming to refugees’ integration and socialization according to the European lifestyle. “Predictability in relation to current events is an important challenge for Praksis. Unpredicted changes such as the closure of many European countries’ borders or the EU-Turkey deal can potentially affect the Program’s response with particular regard to the number of refugees seeking protection from Praksis and the UNHCR”, they stressed. Although it was implied that the specific Programme might be considered one of the most successful initiatives in view of the current international human rights challenges, they did not seek to embellish reality nor conceal the organization’s potential deficiencies. “Nothing is perfect”, the spokespersons declared, “but until today the Relocation Program has indeed benefited thousands of Syrian refugees. Complaints are always taken into consideration and constitute a source of inspiration and improvement for us”. The war in Syria and the humanitarian crisis it caused, led many refugees to silence. Reluctant to speak about their previous life, most of them preferred burying memories of the past instead of suffering from them. During the fieldwork in the camp of Eleonas on 11th of August, the vast majority of Syrians were in the mobile home units, unwilling to meet people and seeking to find some moments of privacy. Six Syrians, including persons and families accommodating in the center or proper apartments, were interviewed. Although, they expressed their gratitude to the country for receiving and treating them respectfully, aspects of daily life within the center were differently perceived by various persons, depending on how they frame their dignity. For instance, complaints concerning the food distribution was a common phenomenon during the first months of the year since there were demands for traditional Syrian recipes. As a Syrian parent complained, “the food is not based on Syrian recipes, affecting my dignity here. It has been improved 10%, only by the replacement of bread with traditional Arabic pita”. Other interviewees seemed more conciliatory, such as Melek, a 58 years-old woman who stated that “it is shameful for us to be greedy and complain about food. Despite its economic plight, Greece has achieved a lot. We have twenty children and we cannot manage them. What about Greece which is daily receiving hundreds of refugees?”. Indeed, the camp’s limited capacity in relation to the number of refugees has led to the coexistence of eight people within a small place, disregarding the right to privacy. As Melek described, “you sleep and you hear the others’ breath. I wake up in the morning and I open the windows because the atmosphere is stuffy”. On the contrary, this right is ensured for refugees benefiting from the Relocation Scheme and Emergency Response Programme. Having experienced both types of accommodation since their first stop was in the refugee camp of Moria in Lesvos, a young couple explained the different living conditions: “We have the keys of the apartment, it’s like having our own house. We can leave and return whenever we want. We don’t have to walk one hundred meters to reach the bathroom as we did in Lesvos. We have access to the internet, we are provided coupons with an adequate amount of money and we can cook the food we like unlike in refugee camps where this is impossible. It’s like living in Germany or France”. From the discussions conducted with refugees, it was observed that everyone recognized the contentious efforts which the Greek authorities and ordinary people have made to respect refugees’ dignity. According to them, this constitutes a non-negligible factor, expunging any signs of racist trends. The fact that all interviewees without exception confirmed that their dignity is respected in the center is quite impressive since despite their hardship, those people can see a bright side of this issue. “In relation to what we have been through in Syria, whenever we claim our rights, the government’s response is immediate. Sometimes the process is slow but in the end our demands are satisfied”, a Syrian family explained with a smile on their faces. The issue of the EU-Turkey agreement and the closure of European countries’ borders was repeatedly put on the table by the interviewees in an attempt to justify Greece’s difficult position and applaud its hitherto response. Being aware of the aforementioned sociopolitical challenges, refugees praised the UNHCR and NGOs like Praksis for treating them respectfully. Particularly, the couple accommodating in an apartment repeatedly expressed their gratitude to the organization for providing the necessary facilities to them and specifically to the pregnant wife. Their comment is more than representative: “Greece is a better country for refugees, but not the country they will choose to live in. Although we are waiting for the asylum process, we are waiting in our own apartment, not in tents. It’s totally different. I wish Praksis was responsible for all refugees in Greece”. Public opinion is significantly determinant when a government’s policy is evaluated and particularly when this policy is related to crucial current issues such as Syrian refugees’ treatment. Interviews with local people in the town where the center of Eleonas is located, offer a wide variety of viewpoints. Particularly, ten semi-structured interviews were conducted on 11th of August, consisting of discussions with one or two persons. The interviewees were randomly selected and include various categories of ages and gender, thus ensuring a satisfactory outcome regarding witnesses’ perspectives. Considering the challenges of this process, it was observed a certain level of difficulty in approaching local people and persuading them about the interviewer’s motivations. Some people rejected any relevant request either by not trusting the research’s validity or by justifying their avoidance to answer with the lack of expertise and experience on the field. Indeed, expressions such as “I’m not an expert to talk about human dignity”, “I haven’t visited the center”, “I haven’t been in touch with Syrian refugees, so I can’t provide a well-grounded view” were prevalent in citizens’ justifications. However, most citizens showed their sympathy towards Syrians by making explicit references to the nightmare of war and its devastating consequences for civilians. War, according to many witnesses, is disastrous and refugees- of all nationalities- should be welcomed and respectfully treated, while some elderly interviewees identified themselves with Syrians since they or their parents had also been refugees in the past. Specifically, by admitting the fact that infrastructures are not enough to accommodate such large numbers of asylum seekers and not turning a blind eye to the difficult living conditions, an interviewee argued that “given the country’s economic plight and its few available resources and options, the Greek government is fighting against its own forces and struggling to provide the best possible solution for those people”. Furthermore, a significant percentage of Syrian refugees’ dignified accommodation is attributed to ordinary people’s donations promoted by awareness-raising programs and private initiatives (Solidarity Now 2016). “Despite the Greek citizens’ limited economic and spending power, they always have something to offer”, an elder woman explained. Interest towards refugees is also expressed by citizens, hosting children in their house for a certain period of time (Ibid). “I have not children, I live alone. Why shouldn’t we help those people? I have the capacity to host these children. Why shouldn’t I offer to them? I cook for Syrian children and this experience has completely changed my life”, confided a young woman interviewed on 11th of August, and continued by saying: “I will never forget those women’s faces while they were watching their children playing and laughing in my living room. Their gratitude and relief would temporary erase the war’s memories”. On the other hand, there was a small percentage of the population perceiving refugees as a threat against their culture. The root causes lie in the religious factor and certain criminal incidents caused by migrants leading to phobic trends and the unconscious generalization of Muslims. A 68 years-old man interviewed on 22nd of August explained, “I believe that they will not get integrated into our society because of their religious culture. They might threat our society by trying to impose their lifestyle to all of us”. It is remarkable that certain interviewees accused the government of privileging refugees more than its own citizens, using expressions like “Nor Greek citizens’ dignity is respected. Dozens of children are fainting at schools because of hunger, thousands of families are patiently waiting in queues for breadlines provided by volunteers. When we live under these conditions, how can we talk about refugees’ dignity?”. Hence, it is observed that although Syrians are welcomed and respectfully treated by citizens, the religious factor is considered a non-negligible hindrance against their integration in a religiously conservative society. It was, therefore, observed that apart from material goods and facilities ensuring adequate living standards, local people stressed the role of tolerance, reciprocity and respect of both sides’ culture in enforcing human dignity. Is the Implementation of International Human Rights Standards Feasible? Chapter 4 has provided essential information about Syrian refugees’ treatment on behalf of the Greek government, constituting a source of relatively detailed analysis of the current living conditions in the reception center of Eleonas. The unexpectedly positive findings pose certain limitations to the initial assumptions which need to be analyzed in order to gain a better insight of the extent to which Greece is finally able to protect Syrians’ human dignity, whilst the approach of this analysis through the lenses of the second Chapter’s theoretical framework will shed light on the dynamics of this issue and its further implications. However, it would be of great importance to clarify that the initiatives implemented to ensure a decent standard of living do not suggest that the country’s infrastructures are adequate nor that it complies fully with its human rights obligations. Living conditions in Eleonas, are significantly different from the majority of reception centers in Athens where other nationalities, such as Afghans, are accommodated, and constitute an exceptional case amid the current turmoil across the whole country. This reception center is considered, according to its representatives and many witnesses, as a haven for hundreds of Syrian refugees and a model for the rest of the country’s camps to follow (The Huffington Post 2015). Indeed, this case suggests that the country does not turn a blind eye to the current humanitarian crisis, but needs to be assisted by other state or non-state actors in order to accomplish its human rights expectations deriving from relevant documents at national, European and international level. Below, it will be analyzed the author’s arguments concerning this issue. First of all, human dignity is deemed to be the most fundamental postulate accruing to every human being regardless race, nationality or social group. However, this value depends not only on the degree to which each society has integrated it but also on the way individuals perceive it. Dignity’s broad definition permits multiple interpretations according to specific persons, circumstances or contexts. Based on the fieldwork’s findings in Eleonas, this argument is verified by Syrian refugees’ unsatisfied need for traditional Syrian food, undermining their dignity. Indeed, food might be considered a secondary factor compared to hygiene or other facilities taken for granted when in other camps of Greece, they constitute a luxury. Humane living conditions are far more than each nationality’s culinary tastes, however food cannot be prioritized due to its differentiated importance for individuals. Replacing tents with containers or providing electricity and clean water suggest a level of dignified treatment. But what is in fact the adequate standard of living for refugees? Is there a specific reference to facilities ensuring decent living standards? Even international and European documents do not provide an explicit measurement of this right and given its ambivalent character, dignity’s definition is left on the respective governments’ discretion. Hence, in the Greek National Decision of 2012 there is an attempt to provide a minimum standard of treatment through its detailed provisions (National Gazette 2012: 2-6). Consequently, although Eleonas is claimed to be a model of reception center, residents will always complaint simply because they differently perceive their right to dignity. The case of Eleonas suggests that despite its limited sources and capacities, the government has mobilized every means to ensure a respectful- even temporary- accommodation for refugees. The permanent presence of government representatives and doctors of the National Health System, in conjunction with the camp’s proper prescriptions, constitutes only one aspect. Educational, leisure and cultural activities compose an unusual standard of living in relation to the rest of the country’s camps, reflecting Greece’s great interest towards Syrians’ culture. The image of Greece as a member of the European Union and numerous human rights treaties constitutes a primary incentive for the country to comply with universally declared principles, while its active involvement into dialogues for human rights’ protection is deemed to be one of the five phases leading to these norms’ institutionalization and integration (Risse and Sikkink 1999:5). Although it might not be able to compete other European countries’ perfectionistic models of reception centers -and should not be compared to them-, the conscientious efforts of the Greek authorities cannot be underestimated. Then the question that arises is: how has the country finally been able to manage such large numbers of refugee arrivals and provide a relatively adequate standard of living? The answer is aptly presented through Merry’s argument regarding the transnational actors’ significantly determinant role in “translating” international human rights norms into familiar terms, thus contributing to their domestic implementation. […] Intermediaries such as NGOs and social movement activists play a critical role in interpreting the cultural world of transnational modernity for claimants. They appropriate, translate and remake transnational discourses into the vernacular. At the same time, they take local stories and frame them in national and international human rights language. Activists often participate in two cultural spheres at the same time, translating between them with a kind of double consciousness. The specific context of each state or society affects the degree to which the adoption and effective implementation of international human rights standards is achieved. Both cultural ideas as well as economic and sociopolitical factors indicate that a state’s authorities might not be able to comply fully with their obligations, entailing the indispensable role of NGOs and activists. As it has been claimed by various respondents during interviews, Greece’s economic plight due to austerity measures results in the limited resources available, thus impeding the effective provisions towards this direction. NGOs involved in the protection of refugees’ dignity seek to provide adequate reception conditions according to international standards through the implementation of relevant programs. Hence, apart from assisting the Greek government, NGOs operate as intermediaries between Syrian refugees’ stories and local society’s existing perceptions about human rights and their de facto realization. Indeed, these actors, through awareness-raising campaigns and their active work in the field, lay the foundations of how refugees should be treated and constitute a living example which need to be followed by the Greek government in order to keep its title as a democratic and hospitable country. By transferring the knowhow, these transnational actors transplant international principles into the national level, aiming to promote a human rights culture through the challenging of existing power relationships. Consequently, as Merry has aptly argued (2006: 6), apart from NGO activism, governmental structure and resources have an enormous impact on how international ideas and regulations are adopted. But for the Relocation Programme funded by the European Commission and the determinant contribution of the UNHCR and Praksis, Syrian refugees would not have been provided such facilities respecting their dignity. Here, I will argue that despite efforts to implement human rights standards, as long as there are signs of racism, their integration and institutionalization need more time to be achieved. The devastating events in Syria have directly affected Greece in the sense that ordinary people either on the islands or the capital are required to deal with the refugee inflows daily and become witnesses of those people’s hardship. No one could turn a blind eye to this humanitarian crisis and consequently, it is impossible for Greek citizens not to be emotionally moved. It has, therefore, been observed a gradual attenuation of this doctrine and its replacement by local people’s tolerance and solidarity. However, the existence of even a small percentage of the population perceiving third-country nationals as a threat against the existing social status quo illustrates that the realization of a human rights culture has a long way to go. Existing ideas and doctrines are not static but subject to changes depending on the circumstances. Since local people, authorities and the non-state actors involved in the field do not operate separately, but constitute indispensable parts of a chain of interdependent relationships, they affect each other and reproduce ideas. Admittedly, the alteration of the present government’s migration policy is accompanied with the citizens’ sensitization towards refugees’ hardship. In light of this argument, notions of national and historical superiority or sentiments of threat constituting the basis of racism, could be addressed through transnational actors’ constant work and Greece’s involvement into a constant human rights dialogue outcompeting any political, cultural or social interests. Drawing from the conducted fieldwork, it is observed that living standards in the reception center of Eleonas, where the majority of Syrian refugees are accommodated, are definitely better than other camps even in the same city. So, why is Eleonas so different in relation to other camps? Is it a coincidence that Syrians are hosted specifically in this camp? Which are the hidden implications behind this policy? Basically, after the EU-Turkey agreement, it is the Greek government which is responsible for providing housing services, and those Syrians who have not the opportunity to benefit from the Relocation Programme, are mainly hosted reception centers like Eleonas (European Commission 2016). The existence of a decent accommodation, compared to other camps, is justified by the fact that Eleonas was the first official reception center which was created to provide a shelter for thousands of asylum seekers arriving in the country. Since August 2015, governmental and non-governmental actors had the time to equip the camp and gradually improve potential deficiencies, while the creation of the rest of the centers constituted a makeshift solution to the increasing demands for providing housing to the large numbers of third country nationals. Although it might not be fully achieved, it is given the impression of an attempt on behalf of the government to allocate asylum seekers into reception centers according to their nationality and ensure that each camp is as homogenous as possible in order to avoid tensions among the residents. The unquestionably recognized legal status of Syrian refugees by the European Union and Greece entails their access to social services and benefits contributing to the respect of their human dignity, implying a certain degree of uneven distribution of funds on behalf of Greece among refugee camps in the city. This factor makes Syrian refugees a priority for the Greek government in relation to other third country nationals whose refugee status is under consideration. Corroborating the aforementioned, it is argued that certain hidden implications regarding the Greek government’s policy have risen, implying the existence of a privileged treatment of Syrian refugees compared to other nationalities. Although Eleonas complies fully with international, European and specifically the national regulations such as the National Decision of 2012, this does not happen in other camps where the government and other actors’ indifference is evident. Prioritizing Eleonas and totally disregarding other refugee camps entails the government’s partial compliance with its human rights commitments. We could, therefore, talk about a certain degree of discrimination among asylum seekers on behalf of both the Greek authorities and the European Union. Admittedly, while there is a variety of programs eligible for Syrian refugees, other nationalities remain on the margins not only of society but also of the Greek migration policy. People from Syria constitute 48 percent of the 61,100 asylum seekers currently living in the country (UNHCR 2016b), and it is consequently questioned why projects and initiatives cannot include other national groups as well. Of course, the recognition of the refugee status is a fundamental and primary factor determining whether a person is eligible for relevant programs or not. However, what can authorities do to improve living conditions for every asylum seeker despite their legal status as refugee? Shouldn’t third country nationals be equally and respectfully treated as long as they are temporary hosted within the Greek territory? If the reason is the lack of adequate infrastructures as well as the bureaucratic procedures, how could Greece, in cooperation with transnational actors such as NGOs and the UNHCR, improve the relevant procedures and achieve a full compliance with international human rights principles and expectations? These rhetorical questions entail implications regarding asylum seekers’ treatment, constituting food for further consideration. How does Syrian refugees’ treatment on behalf of the Greek government contribute to the protection of their human dignity within reception centers? Finally, is it possible for inviolable rights to be sacrificed on the altar of each society’s specific context? Given the fact that societies and ordinary people perceive human rights norms differently as the degree to which they are implemented depends on their indigestion and integration into those people’s mentality, the case of Greece provides a living example of these norms’ embeddedness into the specific national context as well as the possibilities for relevant sociopolitical change. Indeed, although human dignity is considered to be the cornerstone of human rights, the notion of refugees’ dignity needs to be adapted according to Greece’s special needs in order to be fully protected. Even the realization and implementation of supposedly universal principles is always dependent on societies’ contexts and potential deficiencies, implying that there is not one model which can be followed. Corroborating the aforementioned, the various social, economic and political challenges which the country is facing pose further limitations to its ability to effectively ensure decent living conditions in reception centers and consequently, comply fully with its human rights obligations. However, despite the country’s history on inadequate mechanisms and the doctrine shared by the respective governments and local people seeking to deport third country nationals or prevent further arrivals through dire reception conditions, the unprecedented phenomenon of massive refugee arrivals suggests this doctrine’s alteration. Public awareness about Syrians’ hardship and transnational actors’ significant work have contributed to the replacement of racist trends by feelings of sympathy and solidarity. This alteration is evident not only in local people’s attitude but also in the current government’s response in spite of the economic plight and infrastructures’ deficiencies. In practice, it is accepted that the refugee issue came as a surprise for the Greek government revealing bureaucratic weaknesses and constituting a challenge which the country is called to deal with. The fact that Greece has received considerably large numbers of asylum seekers in such a short period of time and managed to provide them a temporary shelter considering its limited financial and structural resources could only be numbered among the advantages. In particular, despite the government’s conscientious efforts to protect Syrian refugees’ human dignity in the center of Eleonas, there are always aspects which need to be improved. Although it is considered an example of hope and solidarity, the camp is already exceeding its capacities in relation to the number of its residents and as a result, every new entry reduces the workforce and volunteers’ efficiency. The defectiveness of the country’s migration and refugee policy was evident during the whole process of receiving and accommodating asylum seekers, but this has constituted a significant experience in Greece’s history. Learning from mistakes, ineffective management provides motivation for further improvements of the country’s relevant policy. Moreover, in view of the government’s slow response, the role of transnational actors, such as NGOs and the UNHCR, was of imperative importance, confirming the initial theoretical expectations regarding their mediating role in transferring international human rights standards into the local context. Admittedly, their role was not just auxiliary but advanced into determinant contribution assisting authorities and accomplishing projects necessary for refugees’ survival. Particularly, the UNHCR, in cooperation with NGOs, has covered a huge amount of workload related to living conditions within reception centers, while its combination with the relevant Ministries’ efforts suggests that Greece does not turn a blind eye to the humanitarian crisis emerged from the large numbers of refugees. Although the issue of living conditions is still at stake generating tensions between residents in many camps of the country, authorities have at least showed great interest for Syrian refugees through the provision of facilities offering a dignified level of accommodation. Moving beyond the idea of living conditions in reception centers, there is an emerging need for a more effective management of the available resources not only at national but also at European level. Greece could be considered as a reflection of the general conditions prevailing within Europe as a union, with the financial crisis, austerity measures and many governments’ racist trends. As a member state of the European Union, Greece affects and is affected by various political and economic processes and as a result, the country’s challenges related to the refugee issue also constitute challenges for the whole Union. Despite the EU-Turkey agreement, the tense relations between the two partners due to the change in Turkey’s policy have caused a negative alteration in the refugee arrivals to Greece. On the other hand, Greece is called to balance between the lack of political cooperation between the European states and consequently the absence of a comprehensive common migration policy, while at the same time has to deal with the large number of NGOs involved in the field which sometimes impede the effective management of refugee camps. Considering the limitations in the Greek migration policy, the refugee issue need to be carefully and responsibly managed from both Europe and Greece. Refugees’ allocation should be implemented according to the economic and population capacities of each member-state through the conceiving of a humane and more realistic solution. The already crowded reception centers, and specifically Eleonas, in conjunction with the country’s pathetic attitude in view of the political turmoil at regional and national level, indicate the necessity for a more active migration policy on behalf of the Greek government. Thereafter, relevant decisions should not be short-sighed, but ought to be taken under the scope of protecting Syrian refugees’ dignity by focusing on long-term solutions and not just temporary and makeshift adjustments. Considering that the country is not able to protect refugees relying only on its own mechanisms, the productive collaboration and adoption of a comprehensive European migration and refugee policy will relieve Greece from the burden of overcrowding thousands of refugees within its territory. In conclusion, human dignity is a right accruing to every individual despite origin or nationality. When jurisprudence becomes prey to political will and interests, fundamental rights cannot be fully protected. Particularly, the refugee issue is the most crucial and controversial current issue afflicting both Greece and Europe, while its hidden legal, political and social implications cannot be easily approached in only one research. What can definitely be stated is that due to the law’s unavoidable embeddedness in local contexts, various actors’ comprehensive cooperation taking specific needs into consideration is of imperative importance. AI (2014) The Human Cost of Fortress Europe: Human Rights Violations Against Migrants and Refugees at Europe’s Borders. London: Amnesty International. Accessed 30 June 2016 <http://www.amnesty.eu/content/assets/Reports/EUR_050012014__Fortress_Europe_complete_web_EN.pdf>. Alston, P. and R. Goodman (eds) (2013) International Human Rights: The Successor to International Human Rights in Context. Oxford: Oxford University Press, Chapter 3 ‘Civil and Political Rights’ and Chapter 4 ‘Economic and Social Rights’, pp. 157-276 and 277-382. Baczynska, G. and S. Ledwith (2016) ‘How Europe built fences to keep people out’, Reuters. Accessed 1 July 2016 <http://www.reuters.com/article/us-europe-migrants-fences-insight-idUSKCN0X10U7>. Bajekal, N. (2016) ‘The Next Greek Crisis is Coming’, Europe News Week. Accessed 30 June 2016 <http://europe.newsweek.com/next-greece-crisis-coming-449410?rm=eu>. ECHR (2010) ‘European Convention on Human Rights’. Strasbourg: European Court of Human Rights. Accessed 28 June 2016 <http://www.echr.coe.int/Documents/Convention_ENG.pdf>. EDAL (2011) ‘Greek Law 3907/2011 ‘on the Establishment of an Asylum Service and a First Reception Service, Transposition into Greek Legislation of Directive 2008/115/EC’. Brussels: European Database of Asylum Law. Accessed 30 June 2016 <http://www.asylumlawdatabase.eu/en/content/en-greek-law-39072011-%E2%80%9C-establishment-asylum-service-and-first-reception-service>. European Commission (2015) ‘European Commission and UNHCR launch scheme to provide 20,000 reception places for asylum seekers in Greece’. Athens: European Commission (press release, 14 December). Accessed 13 August 2016 <http://europa.eu/rapid/press-release_IP-15-6316_en.htm>. European Parliament (2000) ‘Charter of Fundamental Rights of the European Union’, Official Journal of the European Communities (2000/C 364/01). Accessed 15 June 2016 <http://www.europarl.europa.eu/charter/pdf/text_en.pdf>. Εφημερίδα της Κυβερνήσεως (2013) ‘Προεδρικό Διάταγμα 133/2013 για την τροποποίηση διατάξεων του ν. 3907/2011 «Ίδρυση Υπηρεσίας Ασύλου και Υπηρεσίας Πρώτης Υποδοχής, προσαρμογή της ελληνικής νομοθεσίας προς τις διατάξεις της Οδηγίας 2008/115/ΕΚ “σχετικά με τους κοινούς κανόνες και διαδικασίες στα κράτη − μέλη για την επιστροφή των παρανόμως διαμενόντων υπηκόων τρίτων χωρών» και λοιπές διατάξεις”’. (National Gazette (2013) Presidential Decree 133/2013 amending provisions of l. 3907/2011 “Establishment of the Asylum Service and Service First Reception, adaptation of Greek legislation to the provisions of the Directive 2008/115 / EC ‘on common standards and procedures in Member – States for returning illegally staying third-country nationals and other provisions’). Accessed 30 June 2016 <http://asylo.gov.gr/wp-content/uploads/2014/06/P.D._133_2013-AMENDMENT_OF_l3907_AND_PD_104.pdf>. Gaglias, A. and M. Myrillas (2015) ‘Greece’s Eleonas Refugee Camp is a Safe Haven for Afghan Refugees’, The Huffington Post. Accessed 14 August 2016 <http://www.huffingtonpost.com/2015/09/16/eleonas-refugee-camp-athens_n_8146140.html>. Goodwin-Gill, G.S. and J. McAdam (2007) The refugee in international law. Oxford: Oxford University Press, pp. 25-30. Harris, M. (2016) ‘More than 61,100 Refugees and Migrants Trapped in Greece’, Greek Reporter. Accessed 31 October 2016 <http://greece.greekreporter.com/2016/10/30/more-than-61100-refugees-and-migrants-trapped-in-greece/>. HRW (2015) Dispatches: We Want to Live Like Humans. New York: Human Rights Watch. Accessed 18 July 2016 <https://www.hrw.org/news/2015/08/07/dispatches-we-want-live-humans>. HRW (2016) Greece: Refugee “Hotspots” Unsafe, Unsanitary. New York: Human Rights Watch. Accessed 18 July 2016 <https://www.hrw.org/news/2016/05/19/greece-refugee-hotspots-unsafe-unsanitary>. Lambert, H. (2005) ‘The European Convention on Human Rights and the Protection of Refugees: Limits and Opportunities’, Refugee Survey Quarterly 24(2): 43-49. Lichfield, J. (2015) ‘Refugee Crisis: How Europe’s alarming lack of unity over the issue could bring about the breakup of the EU’, Independent. Accessed 30 June 2016 <http://www.independent.co.uk/news/world/europe/refugee-crisis-how-europes-alarming-lack-of-unity-over-the-issue-could-bring-about-the-break-up-of-10492151.html>. Marans, D. (2016) ‘Greece’s Economy is Getting Crushed between Austerity and the Refugee Crisis’, The Huffington Post. Accessed 30 June 2016 <http://www.huffingtonpost.com/entry/greece-refugee-crisis-economy_us_56b12f1de4b04f9b57d7b7d4>. Merry, S. E. (2006) Human Rights and Gender Violence: Translating International Law into Local Justice. Chicago: University of Chicago Press. Merry, S. E. (2009) Legal Transplants and Cultural Translation: Making Human Rights in the Vernacular in Mark Goodale (ed. ), Human Rights: An Anthropological Reader. New Jersey: Wiley-Blackwell, pp. 134-139. Ministry of Finance, Health and Social Solidarity and Citizen Protection, Government of Greece (2012) ‘National Decision n. 7001/2/1454-h/2012 regarding General Rules for the Operation of the Regional Initial Reception Services’. Official Gazette 64 B’. Mutua, M. (2001) ‘Introduction to ‘Savages, Victims, and Saviors: The Metaphor of Human Rights’, Harvard International Law Journal 42(1): 201-219. Official Journal of the European Union (2013) ‘Directive 2013/33/EU of the European Parliament and of the Council of 26 June 2013 laying down standards for the reception of applicants for international protection (recast)’. Accessed 29 June 2016 <http://eur-lex.europa.eu/legal-content/EN/TXT/PDF/?uri=CELEX:32013L0033&from=EN>. Papadopoulou, A. (2004) ‘Smuggling into Europe: Transit Migrants in Greece’, Journal of Refugee Studies: Vol.17, No. 2, Oxford University Press. Parekh, B. (2005) ‘Pluralist Universalism and Human Rights’, in R. Smith and C. van den Anker (eds), The Essentials of Human Rights, pp. 284-286. London: Hodder and Stoughton. Praksis (2016b) European Refugee Fund (ERF)- Housing. Athens: Praksis. Accessed 13 August 2016 <http://www.praksis.gr/en/our-programs/current-interventions/item/erf-%E2%80%93-%CF%83%CF%84%CE%AD%CE%B3%CE%B7-%CE%B4%CF%81%CE%AC%CF%83%CE%B7-%CE%B1-1-%CE%BA%CE%B1%CE%B9-%CE%B1-4>. Praksis (2016a) Our Programs: Finished Projects and Collaborations. Athens: Praksis. Accessed 18 August 2016 <http://www.praksis.gr/en/our-programs>. Risse, T., S.C. Ropp and K. Sikkink (eds) (1999) The Power of Human Rights: International Norms and Domestic Change New York: Cambridge University Press, pp. 1-18. Sakellis, Y., N. Spyropoulou and D. Ziomas (2016) ‘The refugee crisis in Greece in the aftermath of the 20 March 2016 EU-Turkey Agreement’, ESPN Flash Report No. 2016/64. Brussels: European Commission. Solidarity Now (2016) Open YOUR Home. Athens: Solidarity Now. Accessed 15 October 2016 <http://www.solidaritynow.org/grafeio-tupou_en/news_en.html?id=116&lang=_en>. Staudenmaier, R. (2016) ‘Refugees continue arriving in Greece despite EU-Turkey deal’, Deutsche Welle. Accessed 30 June 2016 < http://www.dw.com/en/refugees-continue-arriving-in-greece-despite-eu-turkey-deal/a-19131101>. Steiner, H., P. Alston and R. Goodman (2008) ‘Universalism and Cultural Relativism’, in their International Human Rights in Context: Law, Politics, Morals, (3rd end.) pp. 517-540. Oxford: Oxford University Press. Strickland, P. (2016) ‘Greek Refugee Camps: Children Grow Sicker Every Day’, Al Jazeera. Accessed 15 October 2016 <http://www.aljazeera.com/indepth/features/2016/06/greek-refugee-camps-children-grow-sicker-day-160618114138667.html>. Triandafyllidou, A. (2014) ‘Migration in Greece: Recent Developments in 2014’, ELIAMEP Report Prepared for the OECD Network of International Migration Experts. Paris: Hellenic Foundation for European and Foreign Policy. Accessed 10 0ctober 2016 < http://www.eliamep.gr/wp-content/uploads/2014/10/Migration-in-Greece-Recent-Developments-2014_2.pdf>. UNHCR Bureau of Europe (2012) ‘UNHCR’s Response to the European Commission Green Paper on the Right to Family Reunification of Third Country Nationals Living in the European Union (Directive 2003/86/EC)’. Geneva: Office of the United Nations High Commissioner for Refugees. Accessed 19 October 2016 <http://ec.europa.eu/dgs/home-affairs/what-is-new/public-consultation/2012/pdf/0023/famreun/internationalorganisationssocialpartnersngos/unhcr.pdf. UNHCR (2017a) Refugees/Migrants Emergency Response – Mediterranean. Geneva: Office of the United Nations High Commissioner for Refugees. Accessed 16 April 2017 < http://data2.unhcr.org/en/situations/mediterranean?id=83>. UNHCR (2017b) Greece: Activity Info- Step by Step Guide. Sector Activities 2016- Inter-sector Coordination. Geneva: Office of the United Nations High Commissioner for Refugees. Accessed 16 April 2017 < https://data2.unhcr.org/en/documents/download/50767>. UNHCR Greece (2016) Weekly accommodation/ relocation update. Athens: Office of the United Nations High Commissioner for Refugees in Greece. Accessed 8 November 2016 <http://data.unhcr.org/mediterranean/documents.php?page=1&view=grid>. UNHCR (2016a) Refugees/Migrants Emergency Response – Mediterranean. Geneva: Office of the United Nations High Commissioner for Refugees. Accessed 8 November 2016 <http://data.unhcr.org/mediterranean/documents.php?page=1&view=grid&Country%5B%5D=83>. UNHCR (2016b) The 1951 Refugee Convention. Geneva: Office of the United Nations High Commissioner for Refugees. Accessed 4 June 2016 <http://www.unhcr.org/1951-refugee-convention.html>. UNHCR (2016c) Questionnaire Findings for Syrians in Greece. Geneva: Office of the United Nations High Commissioner for Refugees. UNHCR (2016d) Greece: Accommodation for Relocation Project Factsheet. Geneva: Office of the United Nations High Commissioner for Refugees. UNHCR Regional Bureau of Europe (2016) Refugees and Migrants Sea Arrivals in Europe, Update July 2016. Geneva: Office of the United Nations High Commissioner for Refugees. Accessed 9 July 2016 <http://data.unhcr.org/mediterranean/documents.php?page=1&view=grid>. United Nations (UN) (1948) Universal Declaration of Human Rights. Geneva: United Nations. Accessed 30 June 2016 <http://www.un.org/en/universal-declaration-human-rights/index.html>. Article 1 refers to the refugee definition, emphasizing the protection of persons from political or other forms of persecution. Specifically, refugee status can obtain a person who is ‘unable or unwilling to return to their country of origin owing to a well-founded fear of being persecuted for reasons of race, religion, nationality, membership of a particular social group or political opinion’. UNHCR (2016) ‘The 1951 Refugee Convention’. Geneva: Office of the United Nations High Commissioner for Refugees. Accessed 4 June 2016 <http://www.unhcr.org/1951-refugee-convention.html>. According to the coordinator of the reception center of Eleonas, the permanent residents consist of 35-40% of Syrians. Vulnerable groups might consist of shipwreck survivors, single parent or extended families, pregnant women, torture victims, human trafficking or violence victims and persons with chronicle health problems (Praksis 2016b). The criteria for allocating refugees in the most appropriate apartment refer to single parent families, children’s age, nationality, language and vulnerability characteristics such as disabled persons.